Excuse my delay in replying to your kind and friendly letter3. For ten days now the town2 has been full of returned Nebraska boys4, and, quite aside from the fact that it is a great and exhausting pleasure for me to be with them, they are just now rather distinctly mon affair5. I now feel quite satisfied about the charge6 for proof corrections. I am perfectly willing to stand half of it, as I think that is an entirely fair distribution. I was right7 about Drieeiser8, however, for I have since inquired of his publisher. Yes9, on the whole, I think we had better have a talk about some of these details when it is possible. I have decided not to sign p up with anybody until the fall. I am leaving for Toronto10 tomorrow to spend a month or more with the Hambourgs11. Later I may be in Jaffrey12 for a few weeks later in the summer before I go West. I expect to spend September and October in Red Cloud13. The discouraging thing I get from your letter14 is that Houghton Mifflin, having already handled my books in the way they think adequate, would probably do m not more for them in the future than n in the past. I think, on the other hand, that among the people who form opinion, I have a very different position from that which I had five years ago, and that this fact, for a publicity department interested in such things, makes me a very different business proposition. I am also writing better than I was then, considerably better, which at least is a feature in the case. The publisher here15 of whom I have been thinking favorably, told me frankly that it was a deciding fact in the case a deciding fact in the case with him, and that he wanted "somebody who could do that kind of work and keep it up", and that my three books16, read one after another, had convinced him that I could keep it up. In other words, he wants my "distinction" enough to take risk and trouble for it, while Houghton Mifflin have plenty of distinction, past and inherited, and for the last six years they have been out for quite another sort of bird, in fiction, at least. I am returning some of the documents19 you sent me. Do you know what Swedish firm are translating "O Pioneers!"? Wonderful punctuation! I hope you'll have a fine fishing trip. Nobody20 shall see Claude21 until fall. He22 is getting big enough to look after himself. Frankly, I won't hand him over to anybody who won't do a good deal for him. Faithfully yours W. S. C.
Document is two leaves, typewritten on recto of each leaf only. The year of this letter is established by corresponding letters from Houghton Mifflin staff. 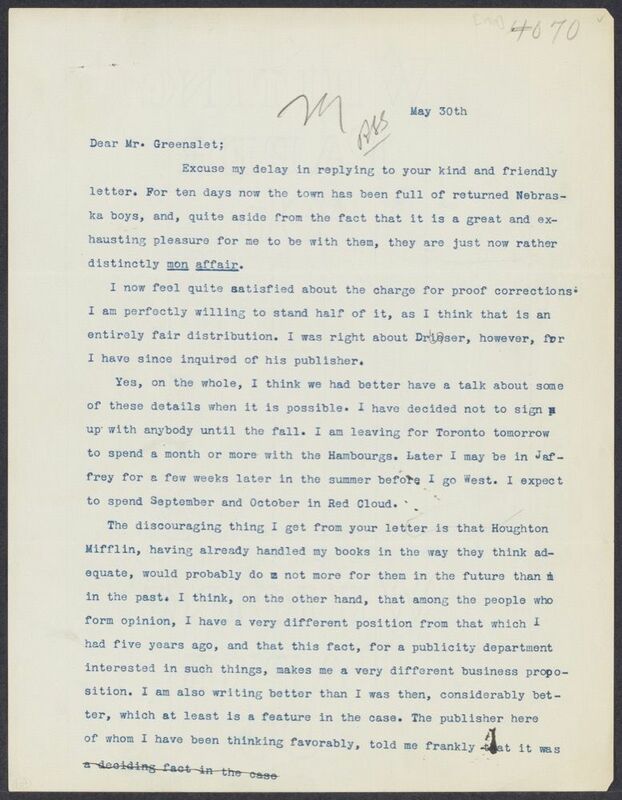 On 20 May 1919, Greenslet acknowledged #0461, promising a fuller response after he had investigated her questions, which he did on 23 May 1919. Cather responds selectively to Greenslet's defense of Houghton Miffln. Returned from Europe, where they had fought in World War I. On 23 May 1919, Greenslet provided an extended explanation of the actual costs of composition and proof correction of My Ántonia and explained Houghton Mifflin's policy. He apologized for failing to examine the charges thoroughly before charging them against her royalties and proposed that she pay half, as was the firm's policy for an author who was "an honest craftsman, not merely a fussy fidler." On 23 May 1919, Greenslet responded to Cather's report that Theodore Dreiser's publisher did not charge him for extensive proof corrections by explaining that he had been given special treatment by a publisher who "competed for his work...rather than with an eye on the principle of what is fair to all." 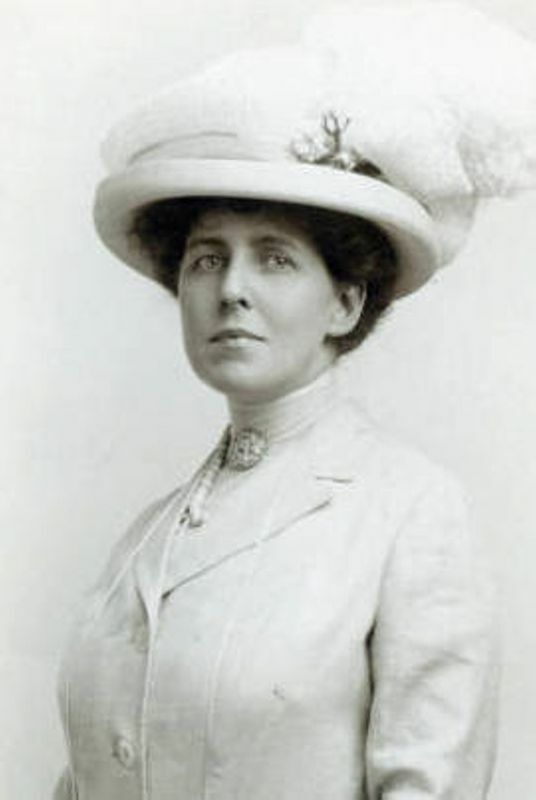 On 23 May 1919, Greenslet proposed that he come to New York City to discuss her grievances against Houghton Mifflin in person. 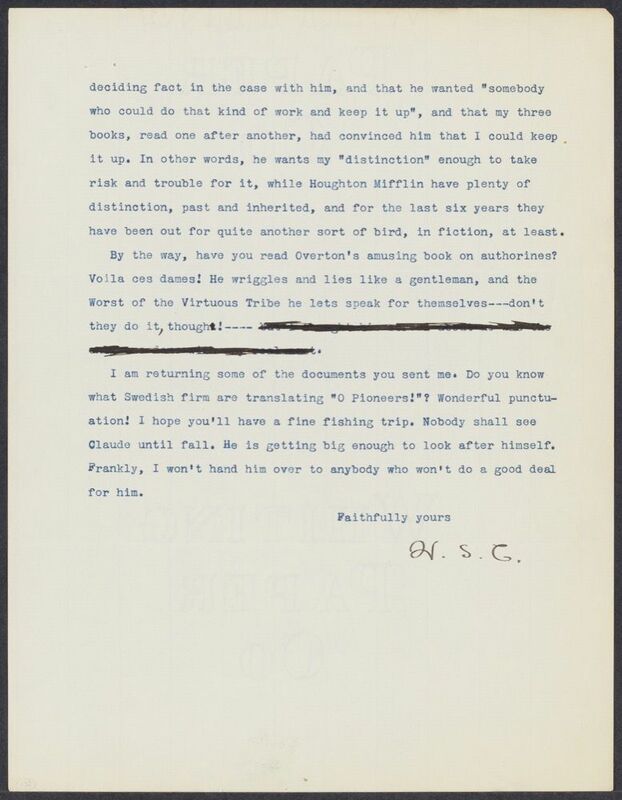 In his 23 May 1919 letter, Greenslet vigorously defended Houghton Mifflin's use of reviews in jacket copy and in advertising and the firm's advertising of Cather's novels generally. He also wrote that he himself believed that "if [she] were to go over" to one of the publishers she reported talking to she "would in the end go worse." With his letter of 23 May 1919, Greenslet enclosed a copy of an "Inter-Departmental Memorandum" about the proof corrections to My Ántonia, a duplicate of the Riverside Press bill for the charges, a copy of his memorandum to the copyright department asking them to send a revised statement, and a clipping of an article from Reedy's Mirror by Henry Melcher that "has some bearing" on Houghton Mifflin's practice of keeping booksellers well stocked with its titles. On 23 May 1919, Greenslet had asked that Cather let Houghton Mifflin see as much of her novel-in-progress as she had written so that they could tell her what they would do for it in terms of publicity. Cather is referring to her novel-in-progress by the name of its title character, Claude Wheeler. Dreiser, Theodore (1871-1945). American author. Born Hermann Theodore Dreiser in Terre Haute, IN, to Johann Paul Dreiser and Sarah Schänäb, Theodore Dreiser grew up in poverty. Even though he did not graduate high school, he attended Indiana University for one year. In 1892 he became a reporter, writing for the Chicago Globe, the St. Louis Globe-Democrat, the St. Louis Republic, and the Pittsburgh Dispatch. In 1897 he began freelancing for magazines. Best known as an author of naturalist novels, his first novel, Sister Carrie, was published by Doubleday Page in 1900, after he substantially revised it and Doubleday almost backed out of its commitment to publish it on moral grounds. After suffering a nervous breakdown, Dreiser moved to New York City, where he became an editor and was involved in radical political causes. He finally completed his second novel, Jennie Gerhardt (1911), published by Harper & Brothers, but publishers remained reluctant to publish his novels as he had written them. Macmillan published his An American Tragedy (1925) and his verse drama Lilith (1926), co-authored with George Sterling. Knopf, Alfred A. (1892-1984). 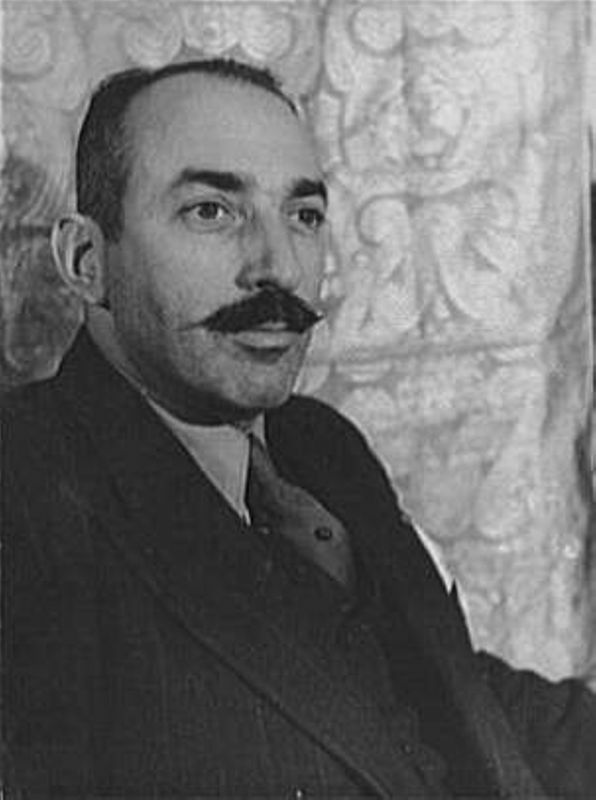 President of New York publisher Alfred A. Knopf, Inc. Knopf received his B.A. from Columbia University in New York City in 1912 and founded Alfred Knopf, Inc., in 1915 with his future wife Blanche Wolf. They married in 1916, and their son Alfred “Pat” Knopf was born in 1918. Cather chose him as her publisher beginning with Youth and the Bright Medusa (1920) and One of Ours (1922), partly because she was dissatisfied with the promotion of her books by Houghton Mifflin but also because she recognized the high quality of Knopf's books, as well as what she regarded as his intelligent advertising. Knopf was noted for publishing the work of leading European and South American writers in translation, as well as original works. Knopf and Cather’s extensive correspondence testifies to their mutual professional respect and to what also became an important personal friendship. Overton, Grant (1887-1930). American writer and editor. Born in New York, Overton worked for the New York Sun from 1906, serving as literary editor 1918-1919; Cather attributed the anonymous highly favorable review of My Ántonia in the Sun to Overton. 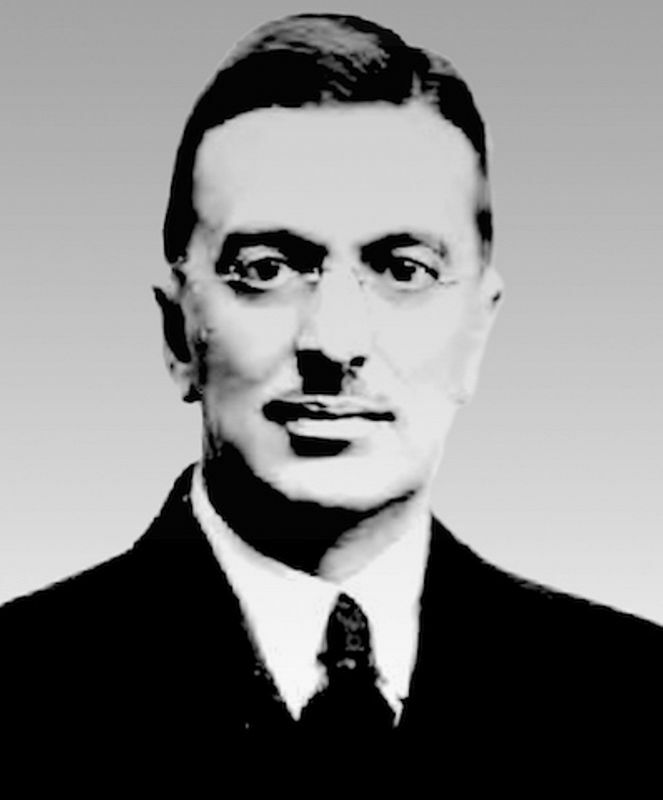 He was an editor for the publisher George Doran, and from 1924 to 1927 he edited Collier’s Magazine, which serialized The Professor’s House in 1925. In addition to editing short story anthologies, Overton wrote biographical sketches of contemporary writers, including one of Cather in The Women Who Make Our Novels (1918).